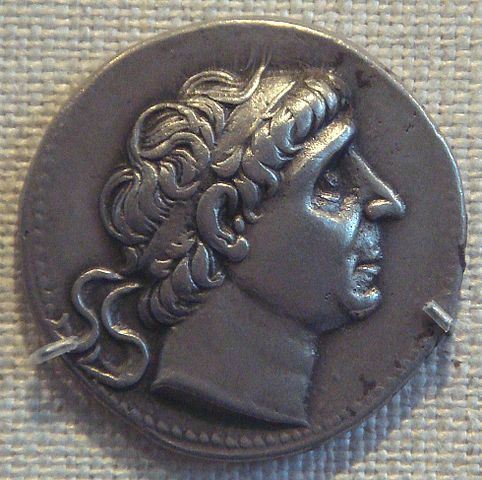 Antiochus II was a Greek king of the Hellenistic Seleucid Empire who reigned from 261 to 246 BC. He succeeded his father Antiochus I Soter in the winter of 262–61 BC. He was the younger son of Antiochus I and princess Stratonice, the daughter of Demetrius Poliorcetes. He inherited a state of war with Ptolemaic Egypt, the "Second Syrian War", which was fought along the coasts of Asia Minor, and the constant intrigues of petty despots and restless city-states in Asia Minor. After making peace with Ptolemy II, he repudiated and exiled his wife Laodice I and married Ptolemy's daugther Berenike instead to seal the treaty. When he eventually returned to Laodike and their son in 246 BC, she poinsoned him and had Berenike and her son by Antiochus murdered. She then had her own son by Antiochus, Seleucus II, proclaimed King.